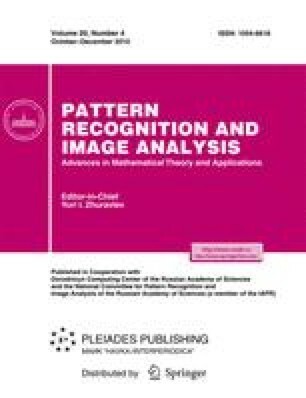 A two-dimensional principal component analysis (2D PCA) method directed at processing digital images is discussed. The method is based on representation of images as a set of rows and columns analyzing these sets. Two methods of realizing the 2D PCA corresponding to the parallel and cascade forms of its realization are presented, and their characteristics are estimated. The application of the 2D PCA method is shown for solving problems of representation and recognition of facial images. The experiments are fulfilled on ORL and FERET bases. Nadezhda L’vovna Shchegoleva. Born in Komsomolsk-on Amur, Russia. Received Ph.D. degree (2000) from Saint Petersburg State Electrotechnical University. 2001–2006 senior researcher in the Federal State Unitary Enterprise Central Research Institute Morphysprobor (JSC Concern Okeanpribor). Since 2007 lecturer at Saint Petersburg State Electrotechnical University LETI, Department of Computer Software Environment, and senior researcher in the Scientific Engineering Center of the Saint Petersburg State Electrotechnical University (JSC SIC St. EGS). Author of one monograph and 18 scientific papers. Current interests: biometrics, including face detection and face recognition Visitor Identification and access control systems, task name it, and face retrieval. Georgii Kukharev. Born in Leningrad, Russia. Received Ph.D. degree (1997) from the Fine Mechanics and Optics Institute (Leningrad, Russia) and Doctor of Technical Science degree (1986) from the Institute of Automatics and Computer Facilities (ABT, Riga, Latvia). Since 2006, full professor at Szczecin University of Technology, Faculty of Computer Science & Information Systems (Poland), and at Saint Petersburg State Electrotechnical University LETI, Department of Computer Software Environment. In 2001–2003 visiting professor of Ecole Centrale de Lyon, Department of Mathematics & Computer Science (Dept Math-Info, ECL, France). Since 2005 visiting professor of Hanoi University of Technology, Department of International Training Programmer. Author of ten monographs, over 100 scientific papers, and over 40 patents (Certificate of Invention of the USSR) in the following areas: computer architecture of signal processing, image processing, and pattern recognition. Current interests: biometrics, including face detection and face recognition Visitor Identification and access control systems, task name it, and face retrieval.